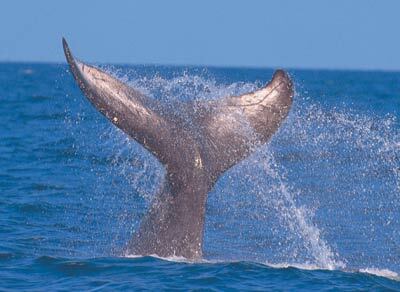 By far, one of the most enjoyable and fascinating activities one could ever participate in is a whale watching tour. Since childhood, I had often dreamed of going on a whale-watching cruise, but I hadn't been given a chance to actually do so until last weekend! I haven't had so much fun in a long, long time! Every year, the official whale-watching season starts on Okinawa in the beginning of February and lasts until the end of March, so if you haven't yet experienced an Okinawan whale watching adventure, now is the time! As far as activities that are fun for the whole family, it doesn't get much better than this! In recent years, whale watching has enjoyed immense popularity with both tourists and locals alike, but it wasn't so long ago that fishermen who hunted the giant mammals made a great mistake by almost driving these animals to the brink of extinction. Because of their yearly migrations to the same coastal waters, commercial whalers around the world have long hunted humpback whales, and most of the humpback population was wiped out in the early 19th century. In fact, their numbers dropped below 1,000 individuals! However, due to this drastic drop, the International Whaling Commission (IWC) enacted an international ban on commercial whaling in 1964. Though the act was a good attempt to save these magnificent creatures, many whalers resumed hunting! In 1986, the IWC enacted a 10-year ban on commercial whaling to determine the status of whale populations around the world and to give these populations a chance to recover, but since the ban came into effect, countries including Iceland, Norway, Japan, and others stubbornly continued to hunt some species of whales! In recent years, though, many countries are finally beginning to realize that these mammals have a greater economic value alive than dead and whale watching has become and extremely popular and lucrative activity in Japan! Every year, Humpback whales migrate from the Northern ocean to the warm and gentle waters of the Kerama islands to breed. Being in such close proximity to Okinawa, this provides a great chance for many to get out in the deep blue sea and experience an exhilarating day of whale watching! I took my first whale watching tour on Monday, February 3, just two days after the official start of the whale watching season. The sky was blue and the breeze was gentle. It was a beautiful day for taking a boating trip! We met at the Tomari port in Naha City at 9:15 a.m. and checked in with our tour at the front desk in the lobby of the Tomari port. There, we received our tickets and were given instructions for boarding the ferry bound for Tokashiki island. The ferry left at about 10 a.m., and an hour or so later we arrived at Tokashiki. Upon arrival, we were greeted by the staff of Sea Friend, our tour guides for the trip, and were brought into a briefing room where we were told what to expect. We were also given a pamphlet in both English and Japanese describing some of the humpbacks' behaviors and other related facts. Fifteen minutes later, we were loaded onto a small boat and sped out to the spot where spotters high up in the hills of Tokashiki had taken notice of whale spouts. At first, there was nothing to be seen, and a few on the boat were getting worried that we wouldn't see anything. The guests on the boat were more or less a quiet crowd, but as soon as the first spout had been seen, we all got very excited! Many jumped out of their seats and exclaimed, "Sugoi! (Wow!)" The first whale had been sighted. The boat came to a complete stop and we were finally allowed out of our seats. A few of us brave ones went up to the front of the boat, but the waves, even on such a nice day, made walking a pretty difficult task! Nobody seemed to mind, though. It took a real talent to maintain your balance. Over time, more and more whales surfaced, spouted mist high up in the air, did tail slaps, pec slaps, fluke(tail)-up dives, and fluke-down dives, each time drawing applause from us spectators! One whale surprised all of us by surfacing less than ten feet away from the front of our boat! "Bikuri! (Surprised! ), Su-ge (Amazing! )," shouted one woman. Three other boats were nearby, and you could actually see the guests on those boat's enthusiasm, even from a great distance! Other times, a whale would surface extremely close to another distant boat and you could only look on jealously, but more or less each boat had an equal amount of luck. Usually, the whales only surfaced for five to ten seconds before plunging back underwater, so we had to keep a watchful eye. All of us were intently scouring the surface of the water for spouts, a torso, any indication that we were about to see what we had come for. After watching the whales for quite a while, we returned to port content with what we had witnessed. A few people had gotten sea sick or drowsy and were lying down in the back of the boat, but most people were talking to friends and relatives all the way back about what they had seen. Personally, I wish I could have seen a humpback perform it's notorious "breach"--thrusting 1/3 of it's torso out of the water and coming back down in a magnificent SPLASH!--but I guess I'll just have to return for another trip. After returning to Tokashiki island, we were directed to a dining area and given bento lunches. However, the small restaurant also had other types of food such as Okinawa Soba and curry if a Japanese box lunch doesn't appeal to your appetite. My first whale watching experience was terrific! However, almost as fascinating as the whale's actual presence was watching them transform a group of quiet, reserved passengers into a shouting, almost childlike, group of onlookers! The trip was really amazing. It's something I won't forget and can only look forward to the next chance I get. Whale watching was more than I had expected! For those interested in taking a whale watching tour, Okinawa Tourist Service (OTS) offers trips for ¥8,500 for adults and children over 12 years of age, and ¥6,500 for children ages 6 to 11 years old. Children five years old and younger are free. Whale watching tours are held daily. If you would like to make reservations, call OTS at 098-933-1152. Parking at the Tomari Port costs ¥200 for the first hour and ¥100 every extra hour, so bring about ¥1,100 for parking. Also, the itinerary and schedule is subject to the weather, so call in advance and make sure your tour is still on-schedule. To get to Tomari Port, drive south on Highway 58 towards Naha City. Tomari Port will be on your left hand side beside the Tomarin building and Kariyushi Urban Resort. 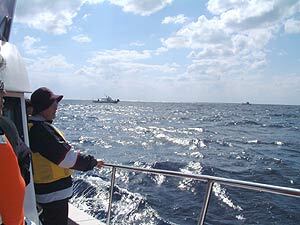 Several other local travel agencies also offer whale watching tours. Have a great time on your whale watching adventure!